Modern shock Absorber kit for the 1928-31. 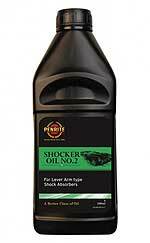 This is a complete shock package that will put modern cylinder style shocks on your Model A. The only extra holes you have to drill are the upper shock mounting holes in the rear cross member. The lower front mount clamps to the axle and does not require drilling the axle. Can be done with body on the chassis. Teflon shock absorber link ball seat set for the 1928-31 Model A Ford, when using the original tubular style shock link. These are made from Teflon material for easy ball to link action. Never needs greasing. It is hard to get grease to each end of the link to grease the original brass seats. Set of 16 seats for four links. shock Absorber arm 1928-31 Rear. Dog Bone style shock Absorber link for the 1928-34 Ford, with the holes on oposite sides. Ford used this style link from 1932, but it will do a nice job on the model A at a lower price. Rubber insert balls included. Shock Absorber link grease seal 1928-34. The rubber grease seal to seal the link where the ball enters. Used on original tube style links only. Set of 8. Made in USA. Shock Absorber link bushings 1928-34. 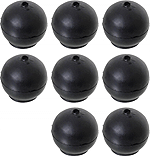 A set of 8 rubber shock link bushings for the dog bone type shock link. Shock Absorber link plug 1928-34 for the original tubular shock link. Made in USA. Tubular shock Absorber link 1928-31. Originally, the model A had this style link. It is what we call the 'tube' link. It comes complete with all of the necessary guts for inside the link. Made in USA. Shock Absorber link spacer 1928-31. For the original type tube shock link. you will need one spacer per link. Made in USA. Shock Absorber seal set for the 1928-31 Model A Ford shocks. Includes info sheet, shaft seals, 'O' rings, check balls, caulking and stem packing for all 4 shocks. Set of 4 shock absorber needle valves, with square head. These were originally used from the beginning of production until October 1930. (If you need the packing as well, they are available in the shock absorber seal set). Set of 4 shock absorber needle valves, with hex Head. These were originally used from November 1930 until the end of production. Rear spring perch ball 1930-31. Ford started making the rear spring perch ball as a seperate piece in February of 1930. Ball diameter 3/4" Shank 1/2" Made in USA. Straight shank rear perch ball 1928-30. Ball that is part of the rear leaf spring perch that the shock link mounts to. Best to use this style when repairing perches that do not have a removable ball. Simply cut the old ball off, drill the perch to 9/16" press the new ball in and weld in place. The benefit to installing this style of repair ball is you don't have to ream the hole with a tapered reamer to install.